Women and girls are now becoming addicted at greater rates than ever before, and until very recently women in recovery were dependent on treatment models based solely on work with men. 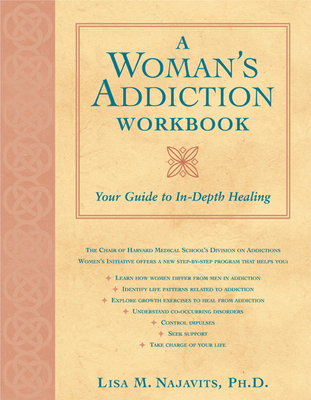 Harvard addiction and trauma expert Lisa M. Najavits offers this step-by-step program to help women overcome the often-overlooked problems associated with their drug and alcohol addictions, such as body image, trauma and violence, relationships, stress, and thrill-seeking. She explores how women differ from men in their addiction and recovery, and adapts this information to help you embark on your journey to healing. A chapter on co-occurring emotional problems allows you to evaluate whether you have any of the key disorders common among women with addiction, such as depression, post-traumatic stress, eating disorders, or phobias. With this strengths-building workbook, begin to come to terms with your personal addiction story. Healing exercises in four areas--feelings, beliefs, action, and relationships--help women build self-respect. Exercises include "Listen to That Small Quiet Voice," "Extreme Self-Care," "Self-Soothing," "Become Friends with Women," "Rethink," "Take Charge," "Share Responsibility," and "Mourn." In addition to these exercises and techniques, the book offers valuable resources of recovery support information. Lisa M. Najavits, PhD, is professor of psychiatry, Boston University School of Medicine; and lecturer, Harvard Medical School. She is a research psychologist at Veterans Affairs (VA) Boston Healthcare System and the Bedford VA; clinical associate, McLean Hospital; and director of Treatment Innovations. Her major clinical and research interests are substance abuse, trauma, co-morbidity, behavioral addictions, veterans' mental health, community-based care, development of new psychotherapies, and outcome research. She is author of over 175 professional publications, as well as the books Seeking Safety: A Treatment Manual for PTSD and Substance Abuse; A Woman's Addiction Workbook; and the upcoming book Creating Change: A Past-Focused Treatment Manual for Trauma and Addiction. She has served as president of the Society of Addiction Psychology of the American Psychological Association; and is on various advisory boards including the Journal of Traumatic Stress; the Journal of Gambling Studies; and Addiction Research and Theory. She has received various awards, including the 1997 Young Professional Award of the International Society for Traumatic Stress Studies; the 1998 Early Career Contribution Award of the Society for Psychotherapy Research; the 2004 Emerging Leadership Award of the American Psychological Association Committee on Women; and the 2009 Betty Ford Award of the Addiction Medical Education and Research Association. She is a fellow of the American Psychological Association; board certified in behavioral therapy; a licensed psychologist in Massachusetts; and conducts a psychotherapy practice. She received her PhD in clinical psychology from Vanderbilt University and her bachelor's degree with honors from Barnard College of Columbia University.